We draw inspiration from the achievements of leathercraft and tailoring. We make sure that the offer is used to get the best quality, variety of colors, different types and models. You can buy fabrics and knitwear by the meter, as well as polyester lining for bags and polypropylene nonwovens. Polyester fabrics, including clothes, nylon fabrics, CANVAS cotton fabrics and skins in various colors. Are you the title of breathing air? We offer distance covers ideal for shoulder and back handles, tourist backpacks. We know very well how important is the quality of additives used in the production of fancy and clothing products. Hardware and accessories in the online store berotex.net are high-quality products that will undoubtedly emphasize the style and design of all products. We have everything you need to make an elegant handbag, evening clutch bag, leather wallet or a durable backpack for great adventures. Bag fasteners, karabiners, bag chains, purse hooks, buckles, press studs and rivets in combination with fashionable material or eco leather will make each product unique. 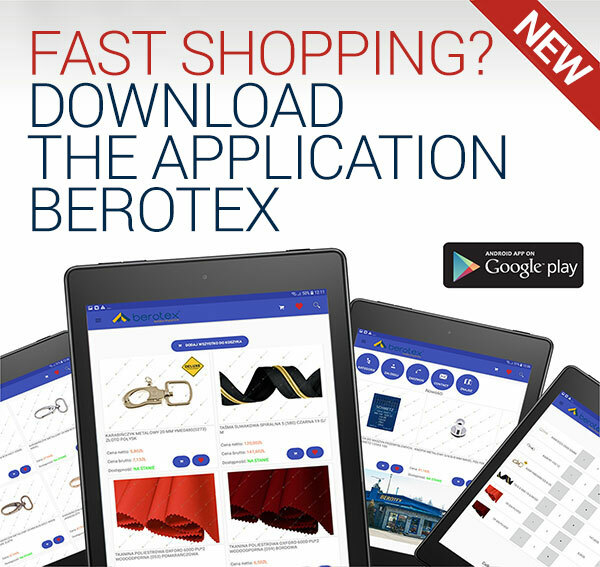 "BEROTEX" fabric and leathercraft accessories wholesale company. Our speciality is textile accessories and leather materials. 20 years we have been importing and distributing items for clothing, tailoring, advertising and decorative branches. We work both for Poland and European market. As a wholesaler of accessories and tailors we attach a great importance to the offered services and products.